Gov. 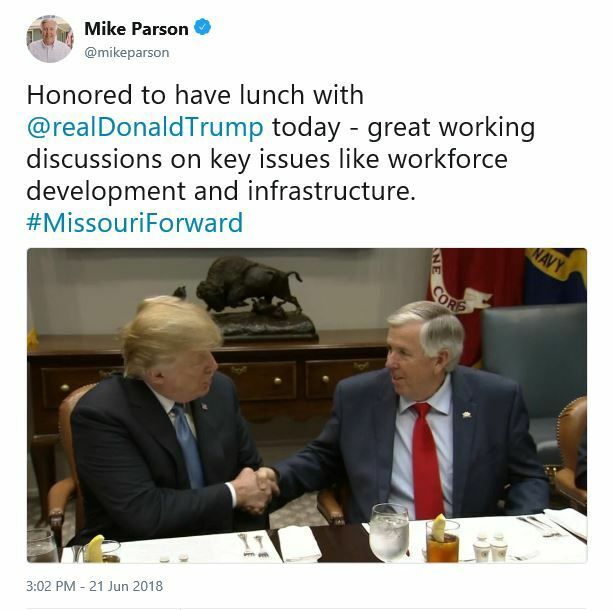 Mike Parson (r): I really don’t care. Do U? Using the word “honored” to be in the presence of Trump worries me. You said that we in Missouri are proud of the leadership in Washington. You better just speak for yourself. You don’t know what we think. A large number of us are angry, not proud. Don’t presume to speak for me. Please tell me you are better than this. Please. I’ve lowered my expectations to just basic human decency at this point. How does it feel to shake hands with the Devil? Haven’t heard much from you since taking over, Mike…not a great start. Did you visit any Kiddie Konsentration Kamps on your trip? Guessing you didn’t discuss tariffs that are shuttering jobs all across Missouri? Well Gov. you just shook the hand of the man that’s gonna be TOXIC to your political career!!! Are you serious? That is ghastly. Let’s just put babies on spikes, then, shall we? …… Do you have a flag? I had high hopes you would be a consensus builder, instead you associate with a racist babysnatcher. You’re just like the rest of them. Working with a person who locks kids in a cage. Can’t get much more tone deaf than dining with him while children are in cages in this country because of him. You have a sad barometer for measuring honor. That’s what you call starting off on the right(wingnut) foot.